At SimsCamp and the German community event at Gamescom we had ample time to test the upcoming expansion pack Into the Future. We did have to share computers but it was interesting to look over the shoulder of other players and watch what they were doing. The new expansions comes with many new, futuristic objects and is a mix of World Adventures and a conventional expansion pack. Traveling to and from the future is probably based on the same (buggy) system as World Adventures and University Life. 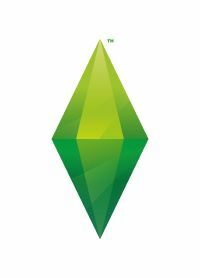 I didn’t try if you can place Sims from the library into the future world or if you can invite Sims from the future to live with you and then take them back to the present. In the Debug version we were able to play all objects in Build- & Buy mode could be bought in either the future or the present. This way Sims were able to buy non-hover cars in the future and use those. I can’t confirm 100% that this will be the case in the version they sell but I would think so. You don’t to be bored anymore while the game is loading. You can now search for objects on the new interactive loading screen. The more you find, the more lifetime points will be awarded to the active family. They are evenly divided between all members of your household. You can turn off the interactive screen in your options. That’s all the new options that come with the expansion packs and I couldn’t find any new folders in the file system either. A much discussed topic are the new glass floors. Those are not really floors but you can find them in the category rugs. There are 1×1, 4x, and 8×8 sized rugs and you can only place them if there’s a floor underneath. I didn’t try to get rid of the lines in between the tiles so I don’t know if it’s possible. Besides the objects there are many other new things to explore. First thing I wanted to try was to see if there are any new cheats. I had to abandon that pretty fast since the Debug-Version has so many cheats you usually don’t see that it was impossible to find out which one could be new. Check SimsVIP’s fact sheet for more info on the new things in the pack. You’ll find plumbots everywhere in the future. You can buy them or build one yourself. They then become a member of your family you can direct and play with. They have an icon with a blue background. There’s a new object in buy mode with which you can build your plumbots. The new CAB gives you the ability to build the bot of your liking. You want your Plumbot to have legs or rather be hovering ? A round or square head ? There are many different elements to choose from and I’m pretty sure, our cc creators will have more stuff for us soon. Any already created Plumbots can be redesigned in the machine if you change your mind later on. You can also implant the Plumbot with skill chips which gives the all new abilities. Those chips can be found in the Sims inventory but I think that’s a bug since they can’t be interacted with. I hope this gets fixed. Plumbots can be sold for money and if you invested in upgrading them you can even make some extra money out of it. Plumbots work as waiters in the new restaurants and they are not afraid of water and even love to dive from the board. 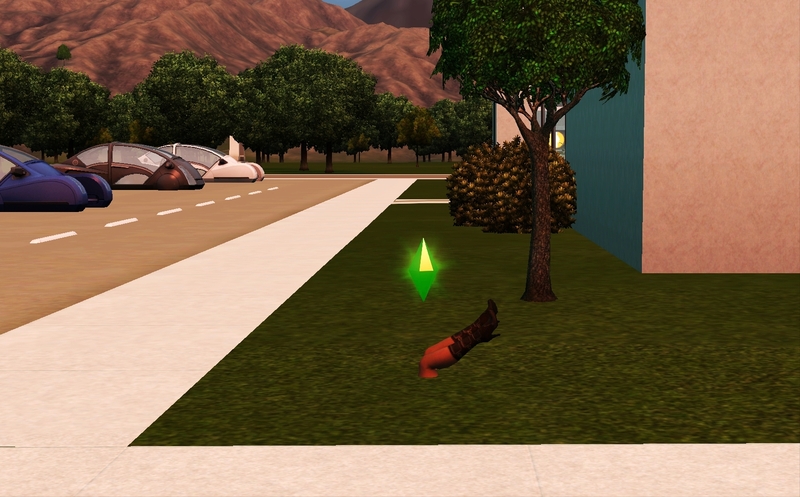 In the future, Sims hover. Taxi’s, cars aand the new metro, everything is hovering above ground. The new hover-boards give your sim a lot of freedom and with the new jetpacks give them the possibility to travel from A to B very fast. They only fly around though if you direct them to do that. If you move from A to B they disappear and reappear (sometimes they land a bit hard and since there’s a Death by Jetpack, they can probably even die) on the lot you wanted them to go. The metro is working as subways do and are about as efficient. You can see them hover around town though. A moment later the time traveler Emmet emerges from the portal and you can talk to him. When you ask him about the future, he will give you your time almanac which is then added the game interface of everyone in the household. Unfortunately you can’t travel to the future right away. You need to help the time traveler to fix the time portal. This is a really simple task and soon you can start your trip to the future. 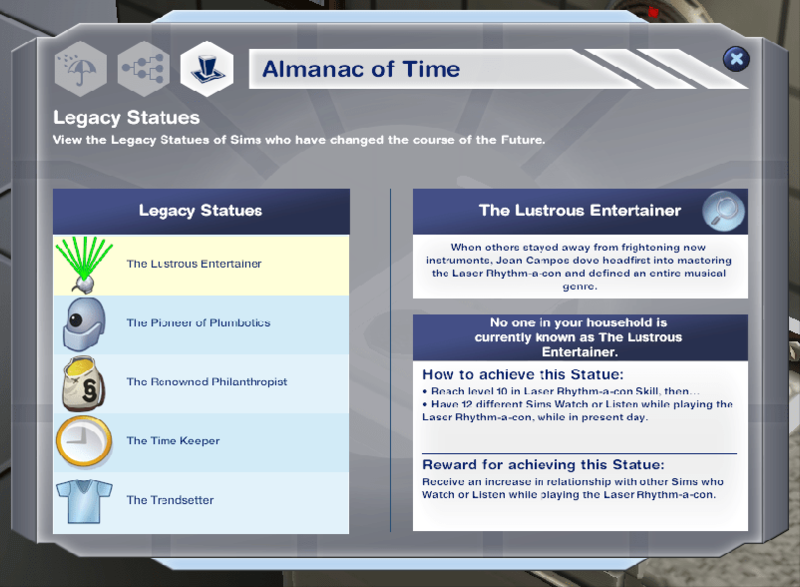 The time almanac has tree tab, which inform you about the future: Which future is active, who are your decendents in the future and some info about them and the third tab shows the different states, which your sim can achieve. I did not check the last part any closer. After arriving in the future, you’re asked where you want to live. Like with World Adventure there’s a base camp or you can buy your own house. 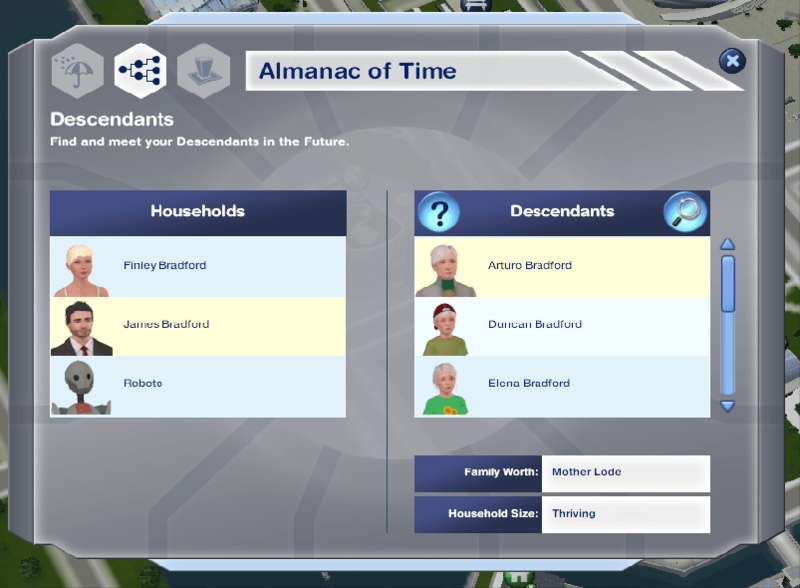 Your descendants are marked with a special icon and you can easily find them through a little magnifying glass in the time almanac. You can go visit right away. Once you befriend them, your new ‘friends’ will also have a special icon in the relationship panel. They can’t be found in your Sims family tree though and I couldn’t check on the descendants tree. The Wasteland has some secrets that can be discovered and as in World Adventures there are dig sites that you can search for stuff. All they find is parts of a key that fit a door to a building at the crash site. I’m pretty sure there’s more to it than what I found and since many of you will want to find that out for yourselves, that’s all I’m going to write about this. Actions you do in the present affect the future. 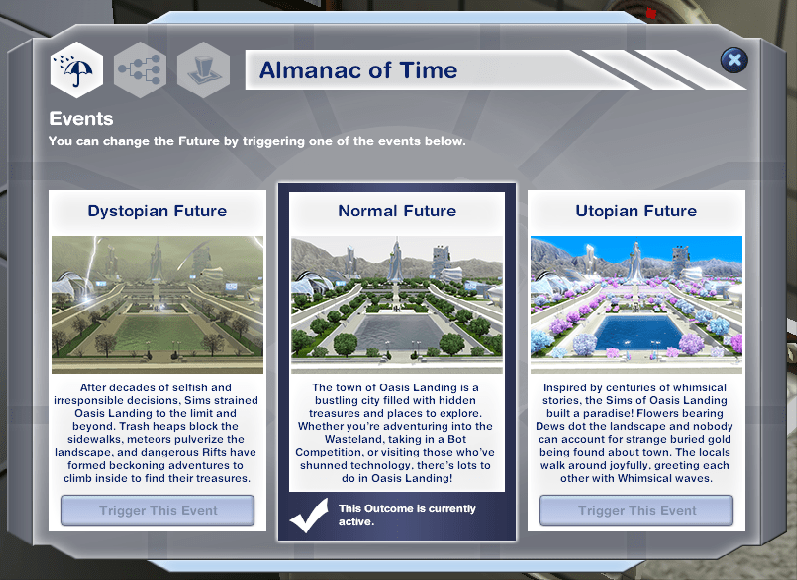 This mainly shows how your descendants live in the future but it’s also possible to change the future for everyone. Oasis landing looks very different if you do. The normal future is exactly that: Normal. It’s not difficult to change the future and will probably get boring with time. The time traveler gives your Sim a few task to solved and bang, the future is changed. the normal time can be restored if your Sim has the technology skill maxed out. He can then repair the time continuum. The expansion has plenty to offer and if you’re interested in the theme, there’s no reason why you shouldn’t get it. The possibility to change the future could be an interesting topic but to me it seems that the variations are rather limited (I did not play that long though and tried out several thing so who knows). The possibility to play for an unlimited time in the future and the different environments that all have a completely different atmospheres could prove very interesting for story tellers and movie makers. There are new objects for builders and the adventure fans have the wasteland to explore. There’s something for everyone and you don’t have to travel to the future if you don’t want to. What I don’t know is if you can hide the portal somewhere. You can deactivate it as soon as it is repaired.